A lot of looping power for such a compact package. Compact size. Large capacity. Onboard rhythms. Launched at this year's NAMM show, the RC-3 is a looper in BOSS's ubiquitous Compact Pedal form. 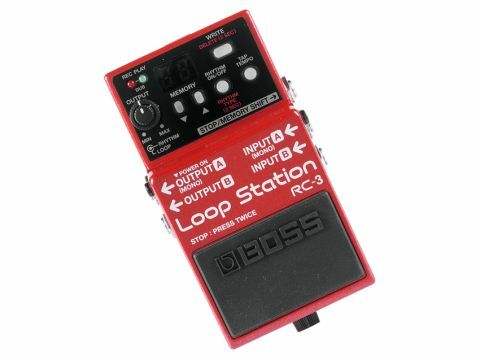 It's not the first time BOSS has provided a looper in this range, but the RC-3 differs from the previous and now discontinued RC-2 in that it offers stereo rather than just mono looping, adds a USB 2.0 connection and vastly increases the storage capacity by providing three hours of recording time and 99 memory locations to the RC-2's 16 minutes and 11 loops. "The sound quality is pristine but, as anyone who has used a looper knows, timing is crucial." Other features of the RC-3 include a rhythm guide: 10 different rhythm types, including rock, pop, funk, shuffle, R&B, and latin with tempo, set numerically in BPM or via a tap tempo button on the pedal's control surface, with a choice of time signatures. Rhythm volume is set by the inner control of the pedal's dual concentric knob, the outer portion controlling the level of loop playback. Rhythm type and time signature are saved alongside any recorded phrases. The RC-3 also sports an auxiliary input for recording stereo audio sources into the pedal and a USB connection, which as well as allowing backup of any loops you've got saved on the RC-3 to computer, also allows you to load any 16-bit/44.1kHz wav files (up to 1.7GB in size) into the onboard memory. Both of these input functions allow the loading of any music that you may wish to loop and learn or perhaps use as part of your live performance. While loop recording, playback and overdubbing can all be controlled via the pedal's own footswitch, there is provision for adding up to two external footswitches to allow more versatile foot control functions - stop, tap tempo, phrase clearing and memory shift - to be carried out. One press on the footswitch starts recording, a second press starts overdubbing, a third press starts playback and to stop playback you press the footswitch twice. Alternatively you can set the RC-3 up so that the sequence of presses is record/playback/overdub. Holding the pedal down operates the undo/redo function. Recording can also be initiated as soon as you start playing your guitar if you use the auto-recording feature. All of this works fine and the sound quality is pristine but, as anyone who has used a looper knows, timing is crucial to getting a rhythmically correct looped phrase. The rhythm guide can obviously help here and you either have the option of playing along with the rhythm with recording starting as soon as you press the footswitch, or hitting the footswitch from silent and having one measure of rhythm as a count-in before recording starts and the rhythm continues. If you don't want to hear the rhythm, you can keep its volume turned right down and just use the flashing rhythm light as a visual clue. There are plenty of different uses for this pedal, whether you just want to jam with yourself, lay down a set of chords to practise over, compose and arrange new songs by adding new parts in overdubs, or use it as a live performance tool, either in recording phrases and looping them live to play over or by using it to trigger pre-recording backing tracks or sound effects - you can set up some of your phrases for one shot playback rather than as repeating loops. The RC-3 also has the facility, via the tap tempo button, to slow phrases down without changing pitch, so it can be used as a phrase trainer for learning any difficult parts that you load into it from computer. The RC-2 has been a very popular pedal, but the new RC-3 kicks the whole concept up to a new level with a balanced set of practical facilities that allow a range of uses, all in a value-for-money pedal that can easily slot onto any pedalboard.